The banking crisis in Europe has three distinct legs according to Lorenzo Codogno and Mara Monti. The first leg was purely financial contagion from the sub-prime crisis in the US to toxic assets held in bank portfolios in Europe, while the second wave was equally intense, amid the negative feedback loop between banks and sovereigns. The third wave is the lagged impact of the economic crisis on the quality of loan portfolios: it has just triggered intervention by the Italian government, but it may require additional public money across the EU. Public money injected today is just a fraction of what was injected at the outset of the crisis. However, more than nine years since the sub-prime crisis started, it is striking that the EU is still facing banking problems. On 21 December 2016, the Italian Parliament authorised up to a 20 billion euro (1.2% of GDP) increase in the public sector borrowing limit to provide capital support to Italian banks, justified as a “precautionary” and “extraordinary event” that is “beyond the control of the State” and is needed to preserve financial stability. As the Bank of Italy put it, this was perceived as a “necessary step since many Italian banks face a number of interrelated cyclical and structural challenges to sustainable profitability. This includes long-term macroeconomic headwinds such as low potential growth and low inflation, a flattening yield curve compressing margins, and weak diversification of business models that are highly reliant on the growth outlook.” It does not really sound like an “extraordinary event”. On 23 December, the Italian government released its “Salva Risparmio” decree that creates a fund of up to 20 billion euro to support the banking sector. In particular, the allotted funds will provide capital and liquidity to troubled domestic financial institutions and protect retail savers. The initiative is designed to help Italian banks in need of additional capital and unable to raise capital on their own. The capital injection will alleviate the problem for some weak banks and help the whole system to achieve more stability. Monte dei Paschi di Siena (MPS), the third-largest Italian bank, will be the first institution to benefit from public intervention. On 22 December, MPS announced it will not be able to complete its planned 5 billion euro capital increase by year-end, as requested by the European Central Bank (ECB) following the results of the July 2016 stress tests. As a result, MPS applied for extraordinary government financial support on 23 December. On 26 December, the bank announced that the ECB increased its capital request to 8.8 billion euro, which will come from conversion of subordinated debt and fresh capital injection by the government as part of the 20 billion euro public support already approved. This is the latest casualty of a European banking crisis that started in 2007 and has continued in different forms until today. Since 2007, the financial crisis has had a major impact on financial institutions across the EU. To reduce the adverse effects of the crisis and restore confidence, EU governments approved State aid to financial institutions in different forms: recapitalisations, impaired asset measures, guarantees, other liquidity measures. For each category there are information on both the maximum amount of aid the European Commission allowed EU Member States to grant (State aid approved) and the amount of aid actually implemented (State aid used). We cannot add the amounts of the four types of measures as they are of different nature. In particular, the sum of recapitalisation and impaired asset measures depicts the actual amounts of funds authorised or injected to support the banking sector, while the authorised or used guarantees and other liquidity measures are contingent liabilities and depict the exposure to risk. For the whole of the EU, the total amount of authorised recapitalisations reached 802.1 billion euro, and the amount actually used was 453.3 billion in 2008-2014, according to the State Aid Scoreboard of the European Commission. The amount of authorised impaired asset measures reached 603.3 billion and 188.5 billion were used. The sum of recapitalisation and impaired asset measures, i.e. crisis funds, gives a huge 1,405.4 billion authorised, i.e. 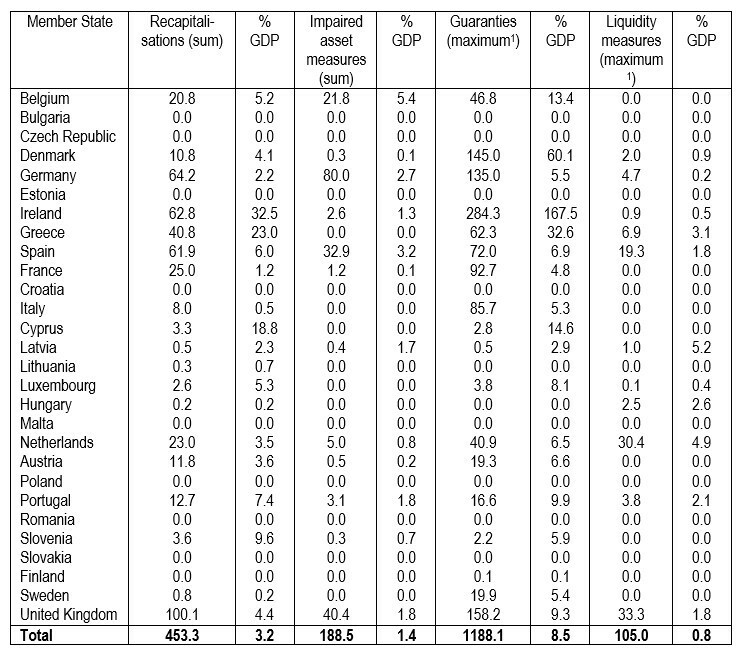 10.0% of 2014 EU GDP, and 641.8 billion used, i.e. 4.6% of 2014 EU GDP. However, governments also used guarantees on liabilities and liquidity measures other than guarantees on liabilities, i.e. contingent measures. In the same period, the maximum outstanding amount of approved guarantees reached a whopping 3,249.0 billion or 23% of 2014 EU GDP, although only about a third was used, i.e. 1,188.1 billion, or 8.5% of 2014 EU GDP. Authorised liquidity measures reached a maximum of 229.7 billion, while those actually used 105.0 billion. Summing the two types of contingent measures, the maximum exposure reached was almost 25% of 2014 EU GDP for authorised measures and 9.3% of 2014 EU GDP for actually used measures. See the Table 1 below for a summary. Note: (1) Maximum outstanding annual amounts during the period 2008-2014. Source: European Commission, State Aid Scorecard. These amounts depict State aid granted to financial institutions within the meaning of Article 107(1) of the Treaty on the Functioning of the European Union (TFEU). However, there are other supports provided to the banking sector that do not qualify as ‘State aid’ as, for instance, capital injection into a State-owned bank. The amounts used for State-owned Landesbank and Sparkasse interventions in Germany are not included in State aid statistics for that country. Note: (1) Maximum outstanding annual amounts during the period 2008-2014, % of GDP refers to the relevant year; the total for the EU refers to 2014 GDP. Source: Our calculations based on European Commission’s State Aid Scoreboard and Ameco databases. 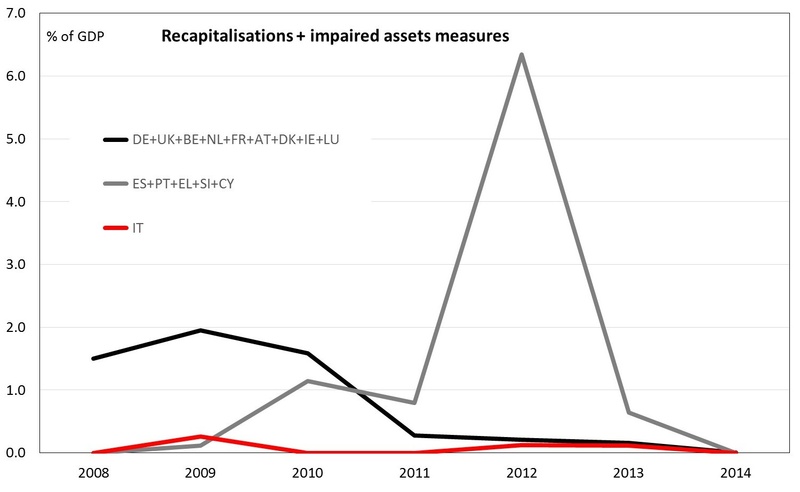 Moving to individual countries, the country that used recapitalisation funds the most over 2008-2014 was the United Kingdom (100.1 billion euro), while it was Germany for impaired asset measures (80.0 billion). Summing the actual amounts used of these two instruments of State aid, Germany was the country that most extensively intervened to support its financial sector during the crisis for a total amount of 144.1 billion euro, 4.8% of GDP. On top of this, there was a sizeable exposure through guarantees (135.0 billion in 2009) and liquidity measures (4.7 billion in 2010). However, in percentage of German GDP these figures are relatively small (about 5.3%). The country that used guarantees the most was Ireland for a maximum exposure of 284.3 billion in 2009, i.e. a monstrous 167.5% of GDP. Then comes the UK with 158.2 billion in 2009 (9.3% of GDP). 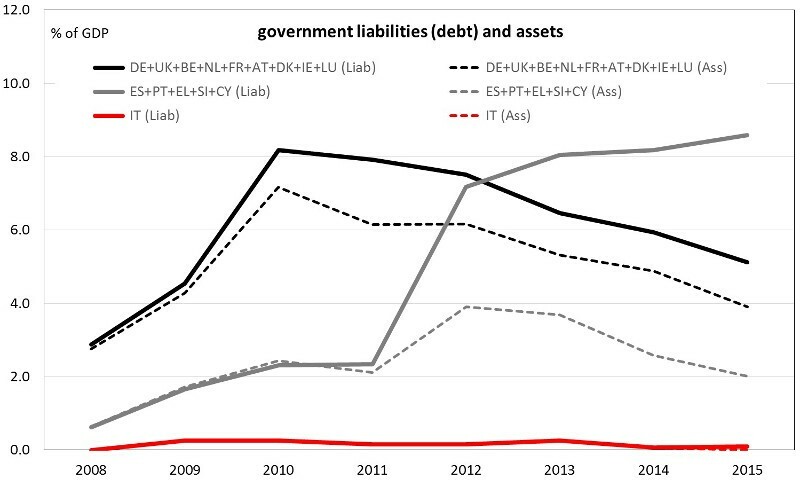 Liquidity measures other than guarantees on liabilities were mostly used in the Netherlands for a maximum exposure of 30.4 billion euro in 2009 (4.9% of GDP). Those banks directly exposed to assets that became impaired following the sub-prime crisis in the US experienced major problems at the beginning of the crisis, i.e. in 2008, 2009 and 2010. The most exposed countries that injected public money at the outset of the financial crisis were Germany, the UK, Ireland, Belgium, the Netherlands, Denmark, Luxembourg, Austria and to a lesser extent France. In 2008-2010, Germany spent 139.2 billion in crisis-related State aid funds for financial institutions, 134.1 billion the UK, 48.9 billion Ireland, 25.6 billion Belgium, 23.9 billion the Netherlands, 23.7 billion France, 7.8 billion Austria and 2.6 billion Luxembourg. Germany and the UK accounted for almost 62% of crisis-related State aid funds spent in the first three years of the crisis in the EU. Please note that this does not included support to State-owned financial institutions, which in Germany account for a very large share of the banking sector. Summing up crisis funds (recapitalisations and impaired assets) for all the nine mentioned countries, we reach almost 92% of State aid actually used in the EU in 2008-2010. Spending in France was limited to recapitalisation and to the initial years of the crisis, i.e. 2008-2009. The same holds true for Belgium and the Netherlands (although more sizeable as a percentage of GDP). The crisis was massive as a percentage of GDP in Ireland and it lasted for longer (there was public capital injection also in 2011). During the first phase of the crisis (2008-2010), aid spending was very limited in Italy (4.1 billion loans mostly for Monte Paschi in 2009), Spain (13.7 billion), Portugal (3.1 billion), Greece (3.8 billion), Slovenia (0.0 billion) and Cyprus (0.0). Stylised evidence suggests that the global financial crisis affected immediately banks in the first group of countries and the countries recognised the problem and reacted swiftly by injecting public money. In Ireland, this happened with some delay, with the major capital injection only happening in 2010, also courtesy of a substantial European support. Irish State aid may be regarded as a lagged reaction to the first leg of the crisis. Since 2010, public money injection declined sharply. Moreover, sharply rising public deficit and debt were a result of the banking crisis more than the other way around. Therefore, we consider Ireland in the first group of countries. Spain suffered from the crisis since its very beginning. However, the response was delayed and the major problems started with the negative feedback loop between the sovereign and the banks. Public money injection peaked only in 2012. Therefore, we consider Spain as part of the second group of countries or the second wave of government intervention linked to the government debt crisis. The first group of countries also massively intervened with contingent measures. 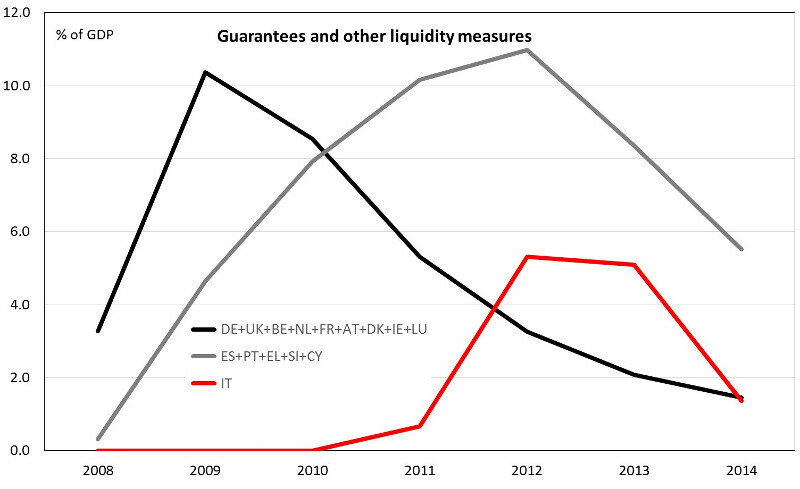 The sum of guarantees on liabilities and other liquidity measures other than guarantees peaked in 2009 to 807.5 billion, i.e. 10.4% of their GDP and 89.1% of the total amount used in the EU. Source: Own calculations based on the European Commission’s State Aid Scoreboard and Ameco. Aggregated figures are weighted by countries’ GDP. 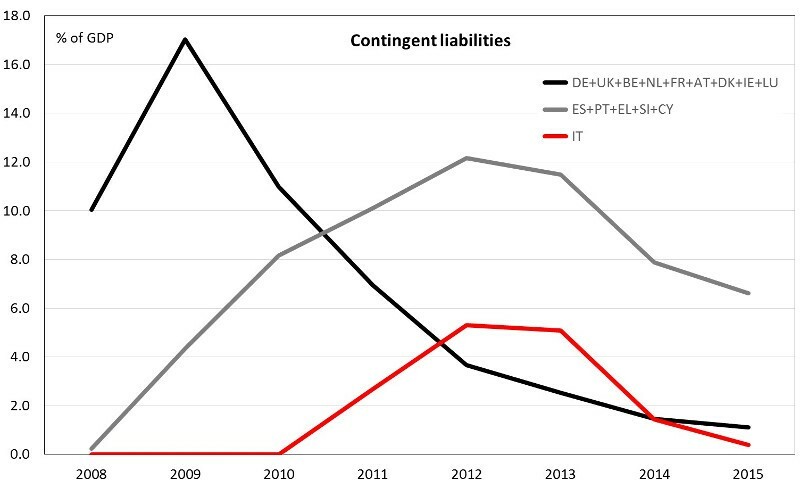 The government bond crisis affected banks in peripheral European countries mainly in three ways: (1) a liquidity squeeze (disappearance of liquidity and activity in interbank markets, needed for the financing gap), (2) losses in the portfolios of assets, and (3) negative economic feedback on the loan portfolios. The government debt crisis started in 2010 and affected Greece, Spain, Portugal, Slovenia, Cyprus and Italy. We exclude Ireland for the reasons previously mentioned and we isolate Italy as it behaved differently. In fact, since the outbreak of the government debt crisis, peripheral countries (ES, PT, SI, CY) injected plenty of government capital into their banking sectors. Crisis State aid funds used amounted to 146.4 billion between 2010 and 2013, i.e. 10.0% of their GDP. In 2012, as a percentage of GDP there was a spike due to public interventions in Spain and Greece (Figure 1). Meanwhile, contingent measures also steadily increased, while for core countries they steadily declined. Peripheral countries started very late in providing contingent support to the banking sector and the maximum exposure was reached only in 2012. Italy was late in recognising the problem, either overly confident about the ability of banks to withstand the crisis or overly worried about the negative sovereign-banks feedback loop. As a matter of fact, intervention was very limited and effectively restricted to loans to Monte Paschi and a few other banks. In 2012, guarantees skyrocketed but the government mostly used them to guarantee an interbank institution (Confidi), which in turn provided partial guarantees to bank loans to SMEs. It peaked to 85.7 billion, i.e. 5.3% of Italy’s GDP in 2012. What was the impact on government deficit and debt? State aid data do not represent the actual cost for public finances resulting from public intervention in favour of financial institutions. For instance, recapitalisation data show the gross amount of funds injected into the banking sector. However, some funds provided to financial institutions during the crisis have already been re-paid, some banks have been re-privatised and some loans have been reimbursed. Data on impaired asset measures show the amounts of aid calculated as the transfer value minus the market value, and the unwinding of impaired asset measures is not taken into account. In other words, State aid data depict the gross amount injected and not the net one. Moreover, the overall exposures to guarantees or “contingent liabilities” represent risk, but not an actual cost. It becomes a cost if the guarantees are called, but only a small fraction of guarantees were called. To see the fiscal impacts of government intervention on government deficit and debt we need to look at Eurostat data, which show the fiscal impact of public support measures. Recapitalisation measures and impaired asset measures are split into an expenditure component (the part of the transaction that is written off immediately) that is reported in flows and impact government deficit/surplus, and an investment component that has no impact on the deficit/surplus and is only reflected as an addition to the stock of financial assets. Eurostat data include flows and the stock of liabilities include an imputed component related to the cost of borrowing of the government. The case of capital injection into state-owned banks mentioned above does not give rise to State aid, but it does affect debt and potentially also deficit/surplus figures. The increase in assets is recorded but it does not contribute to reducing government debt (according to Maastricht criteria, debt is recorded on a gross basis). Overall, Eurostat data are more comprehensive as measures of the economic and financial impact of government intervention as State aid figures serve a different purpose. In 2015, the latest available year of the database, the increase in deficit was particularly large in Greece (4.1% of GDP), mainly due to past recapitalisation of the National Bank of Greece and Piraeus Bank. The second most significant impact on the deficit was recorded in Portugal (1.6% of GDP) in the context of the Banco Internacional do Funchal S.A. resolution operation. Slovenia followed with 1.4% of GDP, where the impact was mostly due to operations of loan write-offs and conversions into real estate and equity carried out by BAMC (a bad bank classified inside government). Then, there was the Cyprus case for 0.9% of GDP. Ireland used 0.7% of GDP for recapitalisation of the Cooperative Central Bank and Austria 0.6% of GDP for the nationalisation of Hypo-Alpe-Adria-Bank International AG. Over 2008-2015, the most sizeable impact on the deficit as percentage of GDP was recorded in Ireland in 2010 (21.3%), Greece in 2013 (10.8% of GDP), Slovenia in 2013 (10.2%) and Cyprus in 2014 (8.5%). In cumulative terms, Ireland recorded a cumulative impact on the deficit of 27.4% of GDP. In the period 2008-2014, the worsening of deficit figures was much smaller than the total amount of State aid actually used, meaning that a number of interventions were considered as ‘investment’ as thus affected debt figures only (liabilities) and the assets position in 2008-2015. 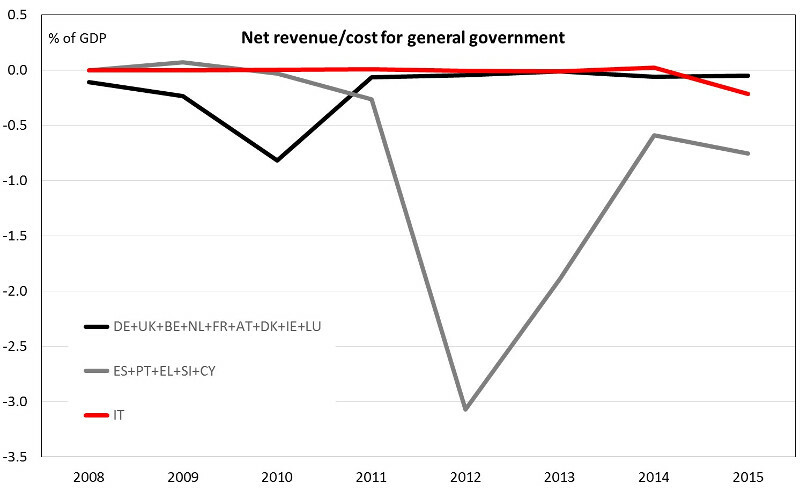 In a few countries (Denmark, France, Luxemburg, Hungary, Sweden) the cumulative impact on deficit/surplus figures was positive due to fees on guarantees granted to financial institutions, property income (interests and dividends) receivable from financial instruments acquired by governments, and from other revenues such as specific capital taxes. The cumulative negative impact on deficit/surplus was 114.0 billion for the first group of countries and 94.7 billion for the second group; for Italy, it was 3.2 billion. In percentage of the relevant GDP, the impact was negative for 1.4%, 6.5% and 0.2% respectively. The total impact on government debt for the EU reached a maximum of 765.1 billion in 2012 (4.3% of GDP). For the first groups of countries (DE, UK, BE, NL, FR, AT, DK, IE, LU) the maximum impact of debt was recorded in 2010 with 584.9 billion (7.2% of their GDP), while for the second group (ES, PT, EL, SI, CY) the maximum impact was recorded in 2015 with 127.7 billion (8.6% of their GDP). For Italy, the peak was reached in 2013 with 4.1 billion (0.3% of GDP). Let us remind that the first group accounted for 66.6% of EU GDP in 2015, while the second group only for 10.1% and Italy for 11.2%. Source: Own calculations based on the Eurostat and Ameco data. Aggregated figures are weighted by countries’ GDP. Interestingly, the impact of general government debt peaked in 2010 for the first group of countries and since then it has declined, while for the second group it has increased throughout the period. Moreover, for the first group of countries the amount of assets was close to that of liabilities at the beginning of the crisis, the gap widened in 2010 and since then it has remained broadly stable, suggesting moderate losses on the ‘investment’ in the financial sector. For the second group of countries the gap has continued to widen since 2011, suggesting significant losses on the ‘investment’ made by the governments. In 2015, the outstanding amounts of liabilities and assets related to government intervention were 8.6% and 2.0% of GDP respectively (Figure 4). The widening gap is explained by loan write-off and conversion into real estate and equity (Slovenia), a fall in the market value of bank shares held by government (Greece) or redemption and conversion of preference shares of banks (Ireland). In all cases, it is effectively a loss for the governments according to market valuations. While the first two factors that affected peripheral countries since the debt crisis (a liquidity squeeze and losses in the portfolios of assets) were immediate, the negative economic feedback on the loan portfolios is a creeping slow-moving phenomenon, which may eventually force a new wave of government intervention. 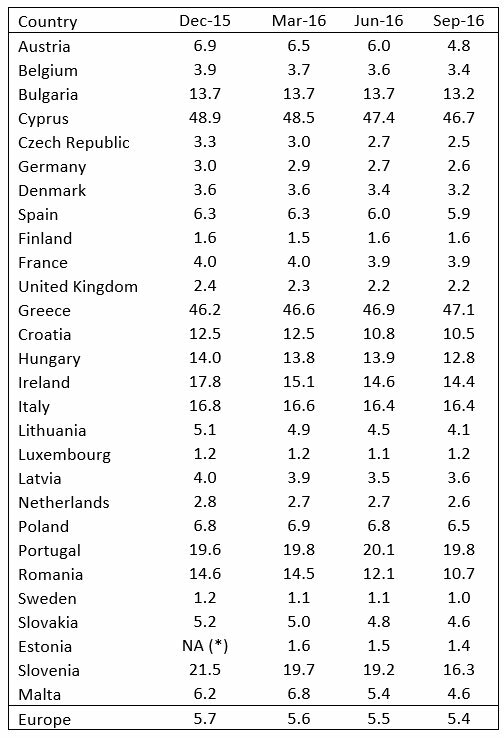 Table 3 shows the stock of non-performing loans in EU countries. While in some countries, courtesy of a decent economic recovery, the stock has moved back to low levels in percentage of the GDP of the country, in others it remains very high. With MPS intervention, Italy is the latest European country that uses State aid for banks. As State aid is no longer allowed by European rules, it used Art.32 of the Bank Restructuring and Resolution Directive (BRRD) to circumvent bail-in and inject what is called “precautionary recapitalisation” to preserve financial stability. There is a chance, however, that this extra help by the government, by avoiding financial stability risks puts in motion a virtuous cycle by which stronger valuations in financial markets attracts more investors and the economic recovery and the recovery in house prices help a speedier reduction in the stock of NPLs. In other countries, it is less likely that banks will be able to steadily reducing their stock without government intervention. As a result, the recent intervention in Italy may well be the start of a third wave of government intervention in the countries most exposed to non-performing loans, with an increasingly lower probability that the injections of capital will produce positive returns over time. Having addressed banking problems in earnest was a plus for the countries that did it. A first massive intervention happened right after the US-induced shock in financial markets following the sub-prime crisis. With the exception of contingent liabilities, interventions were deficit and debt increasing. Impaired assets resulted in substantial capital needs to address the losses and this was done more or less swiftly in 2008-2009 and affected mainly Germany, the UK, Ireland, Belgium, the Netherlands, Denmark, Luxembourg, Austria and to a lesser extent France. Government intervention to support the banking sector in the initial stage of the crisis was truly massive, but it seems to have resulted in a somewhat smaller economic impact and a quicker recovery in credit. The second wave of banking problems started with the Greek crisis and produced its effects on State aid, deficits and debt mostly from 2011 onwards. This second wave triggered again massive public intervention and resulted in an ESM programme for the Spanish government to support the banks. In parallel, European leaders said “never again” and wanted to break the link between banks and sovereigns. This led to the re-introduction of State Aid rules in the summer of 2013 and then the introduction on the Bank Resolution and Restructuring Directive (BRRD), which became effective in January 2016. Government intervention was much smaller in absolute terms but massive relative to the GDP of the countries affected by the second wave. Intervention was severely constrained by deteriorated public finances and negative feedback loop between sovereigns and the banks to the point that, in the case of Spain, European money became necessary. Since then, the attitude has changed and the European framework moved in the direction of forcing investors and depositors to pay for any future crisis. In the meantime, however, policymakers did not recognised promptly enough the creeping deterioration in non-performing loans and their effect on lending and the broader economy, and the possibility of intervention became much more limited. As a result, the situation continued to deteriorate up until today’s crisis in Italy, which may be the start of a third wave of government intervention in the EU. It mainly relates to the leftovers of the previous crisis and the lagged impact on non-performing loans. Luckily enough, the economy has improved in the meantime and banks have worked out their solutions as well. Today’s banking problems in Italy are manageable and are likely to require substantially less public money than in the past in other countries. However, the stock of non-performing loans is much higher in other peripheral countries and thus more casualties are to be expected during the course of 2017. Note: This article gives the views of the author, and not the position of EUROPP – European Politics and Policy, nor of the London School of Economics. Featured image: Banca Monte dei Paschi di Siena, Siena, Italy. Credits: DV (CC BY-SA 3.0). Lorenzo Codogno is Visiting Professor in Practice at the LSE’s European Institute and founder and chief economist of his own consulting vehicle, LC Macro Advisors Ltd. Prior to joining LSE, Lorenzo Codogno was chief economist and director general at the Treasury Department of the Italian Ministry of Economy and Finance (May 2006-February 2015). Throughout this period, he was head of the Italian delegation at the Economic Policy Committee of the European Union, which he chaired from Jan 2010 to Dec 2011, thus attending Ecofin/Eurogroup meetings with Ministers. He joined the Ministry from Bank of America where he had worked over the previous 11 years. He was managing director, senior economist and co-head of European Economics based in London. Before that we worked at the research department of Unicredit in Milan. Mara Monti is Visiting Fellow at the LSE’s European Institute and a journalist at Il Sole 24 Ore, Italy’s leading financial/economic newspaper, based in Milan. She completed an MSc (Econ) in Politics of the World Economy at LSE career in journalism, specialising in the financial sector. Over the past 16 years, she has been part of the financial team at Il Sole 24 Ore, writing extensively on financial issues, sovereign crisis and monetary policy issues. Prior to joining Il Sole 24 Ore, Mara worked as editor-in-chief for international news agency Dow Jones Telerate in Milan. She wrote several books investigating the bankruptcy crisis of the past ten years and probing into financial scandals.